So the plan was to attend the wine and wisdom as a part of the competition but further to this during the break (around halfway through) I was to create and serve 3 cocktails of my own choosing. The alcohol was supplied by the company and any donations were towards comic relief. The thought process was simple I was given a simple brief: 3 eye catching but simple cocktails. Something that looks good but at the same time wouldn’t take all night to create. So this is the cocktail I’ve been waiting to make at an event for some time, it was far too obvious for the Mexican themed party I did a while back and not cheap enough for the other event I did (tequila can cost a small fortune over here in the UK). This recipe is simple sure, but its visually effective as the grenadine instantly sinks to the bottom and then over time will work its way into the bulk of the drink, rising in an aesthetically pleasing reddish-pink hue(hence the name). The Hawaiian Bay Breeze is a cocktail born out of experimentation. 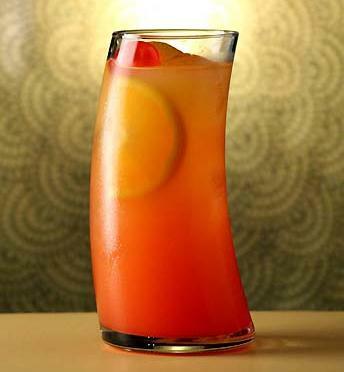 Replacing the orange juice used in most Vodka Sea Breezes this drink instantly supplies a Caribbean kick to a drink already made refreshing thanks to the cranberry juice. 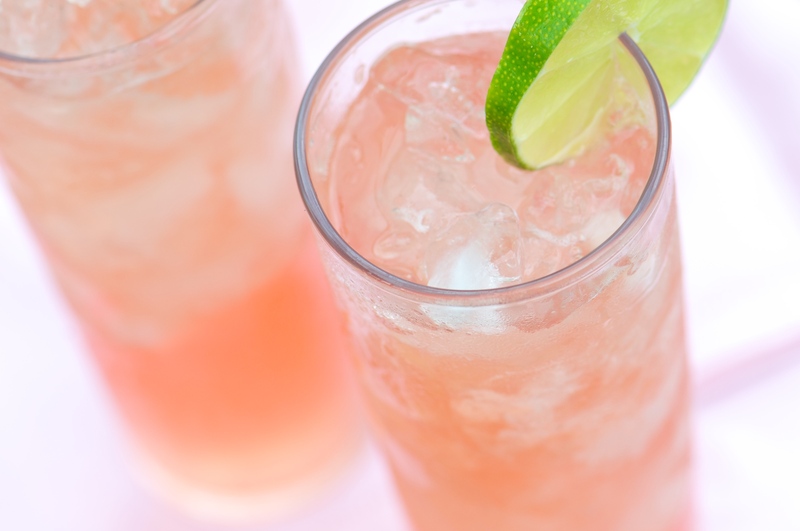 Not only is it far better in taste than a normal sea breeze cocktail, the pinkish hue the drink creates in a lightly lit room is something special (something orange juice and cranberry juice just cannot supply). Served over ice this drink becomes a light and refreshing cocktail that is worthy of any event. This one in particular was by far the favourite of the three cocktails available at the wine & wisdom, out-playing the tequila sunrise by around 5-10 drinks. 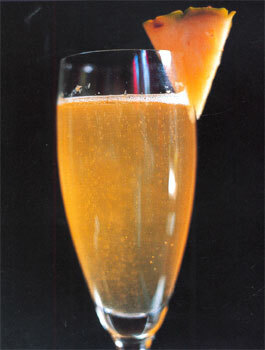 This cocktail is a spin off from research for a future post, and is for all intents and purposes a champagne cocktail. The recipe I had used Veuve Clicquot champagne with rum and pineapple juice. Mixing equal parts sophistication (champagne) and fun (white rum and pineapple) this drink encapsulates the very best of the champagne cocktails. Whilst this recipe calls specifically for Veuve Clicquot, it is a rather expensive and inefficient mixer for an event catering for 50+ people; unless you’re flashed for cash in which case go for something even more expensive! – If things are the opposite and you find you’re on a tight budget then try using a good quality Prosecco. It gives the same experience with a little less body to the drink (generally speaking anyway). 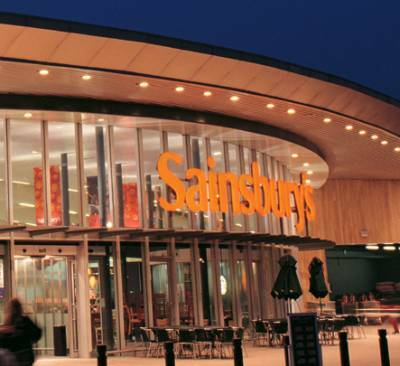 At the Wine & Wisdom I used ‘Sainsbury’s Taste The Difference ‘TTD’ Prosecco Conegliano. This is a good quality Prosecco that is genuinely one of my favourite ‘budget buys’. All the cocktails were well received and enjoyed by everyone that tried them, granted the Clicquot Rico was the least consumed and that was mostly down to everyone taking the other two recipes and running off before I had them fully prepared. Otherwise the Hawaiian Bay Breeze was the stand-out favourite, the Caribbean flavour the pineapple brings to the drink, seemed to be the defining feature. Whilst the event in general did not go as i had envisioned (it was rather poorly organised on the companies part) the cocktails went down well and everything i had control over worked. Which for me is a small victory. It shows that people are receptive to the unique nature cocktails bring to an event.